Church Visit – maximum ~12 minutes each parish ( 2 decades of the rosary each – except the Cathedral and the last parish). We should be done close to 11:30 pm or midnight after visiting all the parishes. We do not have to recite the rosary in unison but it is a suggestion. 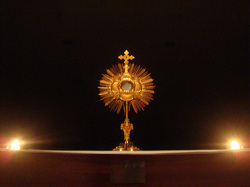 You can perform your own Eucharistic Adoration Prayers or recite your own personal communication with Our Lord. Please let me know if you are interested in doing this by emailing me at yagroup.stjosephcathedral@gmail.com so that we can coordinate the event properly.